Here it is. The first post ever on the official Entertainment[Scam]Entertainment blog. I'll be updating this blog with all kinds of good stuff having to do with all the latest news about the movies and other productions that we are starting to make here pretty soon. I highly recommend you follow or bookmark this blog because I plan on updating pretty frequently with production photos, videos, script passages and other nonsense. So with that in place I think its time that I unveiled the movie we've been working on for a while now. We start shooting some time next week and I'll be sure to update with a lot of photos from the set and stuff like that. 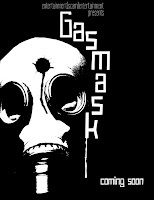 The movie is called Gasmask and is a slasher film re-imagining. I've always loved the slasher genre and this is kind of our throw back to that. We are doing a few things a little bit different that the normal slasher but I'll wait for a future update to say what those things are exactly. I do have a teaser poster that I made a few minutes ago. This is just that, a teaser. The only thing on the poster that is true to the movie is the title. The mask that is featured is not the same type or color as the mask we are using in the movie. It's not even the proper dimensions for a movie poster but I had to do something for this first post, so here it is.